Ha! 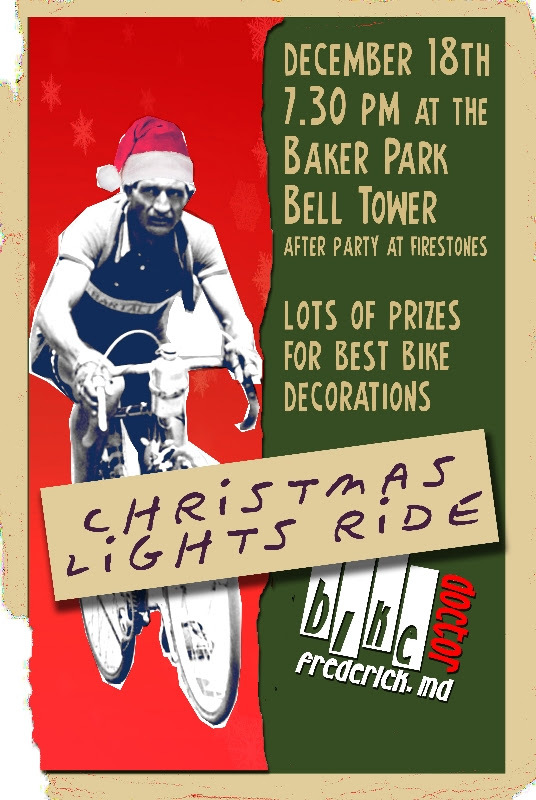 The 4th Annual Bike Doctor Frederick Xmas Lights ride in downtown Frederick is fast approaching. Who: You and 100 other riders. Kids who can easily pedal 4 miles can come along, if they have lights and a helmet. Where: Baker Park Bell Tower, next to the Armory. What is it? : A X-mas lights viewing ride around Frederick City. A few miles, casual pace, mostly flat. We ride as a big group, no one gets spit off the back. What do I bring: A bike, a rear blinky light or enough battery powered xmas lights that you dont need a blinkie. Gotta decorate your bike. BRING A LOCK, if you are coming to the post ride hang out at Firestones. Post Ride Party thing (21+): Firestones on Market Street. Here’s the deal: We ride around in the bitter cold and look at good and bad X-Mas lights on houses in various parts of the city. It’s a short ride, probably ok for kids over say… 8, that are used to pedaling. It’s a super casual pace, we ride as a big X-mas theme’d Amoeba, and eventually end up at Firestones for the afterwhatever. You have to decorate your bike. The more extravagantly the better. Any December based Holiday theme applies, not just X-mas. We will post helpful hints about this as the time draws near. The top 3 decorated bikes (popular vote) win some cool bike theme’d prizes. Much better than last year, where we gave out some peach colored glasses and some half eaten cheetos. Bike Doctor Frederick Shop Rides, bike doctor in the world at large, clinics/shop events, Frederick Epics, Frederick Riding, Townies, what's your epic? ← A few more pics of our sale bikes. Scroll down a bit to see sizing and availability.